Hoodie Melo, LeBron’s headband, A.I’s shooting sleeve and more iconic NBA accesories. August continues to be a barren month for NBA news. The sweet, sweet high of the schedule release only lasts but so long, and Kevin Durant feuding with a spoiled, disgraced reporter on Twitter isn’t quite as exciting as watching him raise up over LeBron for a go-ahead three in the final minutes of a Finals game. With that in mind, The Crossover was very excited to see the return of “Hoodie Melo” earlier this week. For those unfamiliar, that’s the version of Knicks star Carmelo Anthony that plays basketball in a hoodie, an article of clothing that seems to make Melo’s game at least 25% better. That got us thinking, what are some of the most powerful accessories that shouldn’t have—but somehow did—make NBA players better? So this is technically a reverse-accessory situation, because LeBron’s game actually goes to new heights without his headband. The first time we really saw no-headband Bron was in the fourth quarter of Game 6 of the 2013 NBA Finals. Down 3–2 and losing by double digits, James fueled an incredible Heat comeback and couldn’t be bothered to replace his headband after it was knocked off during a foray to the rim. James was playing with the most desperation he ever had in his career, and as a Heat fan, I was so mesmerized with his performance, I legitimately wanted him to ditch the headband for Game 7. LeBron has gone sans headband since returning to Cleveland, and that’s only propelled him to some of the finest Finals performances in the history of the sport. Basically, LeBron would have seven rings by now if he entered the league sporting no gear above the neck. The GOAT NBA accessory. You could make a documentary on A.I.’s shooting sleeve. It’s also probably the most influential NBA accessory of all-time. What’s funny is while Iverson was a thrilling-as-hell scorer, he was never all that great of a shooter. His career field-goal percentage is 42.5%, and he only shot 31.3% from three. But I’d argue that makes the sleeve’s legacy even greater. You know how good you have to be at basketball to make an accessory popular even if it’s not really helping you with the skill it’s specifically designed for. An extreme example of this would be everyone copying Shaq’s free-throw routine. Ultimately, there was something unmistakably cool about Iverson’s shooting sleeve. Just watching him pull it up on his arm during games was awe-inspiring. 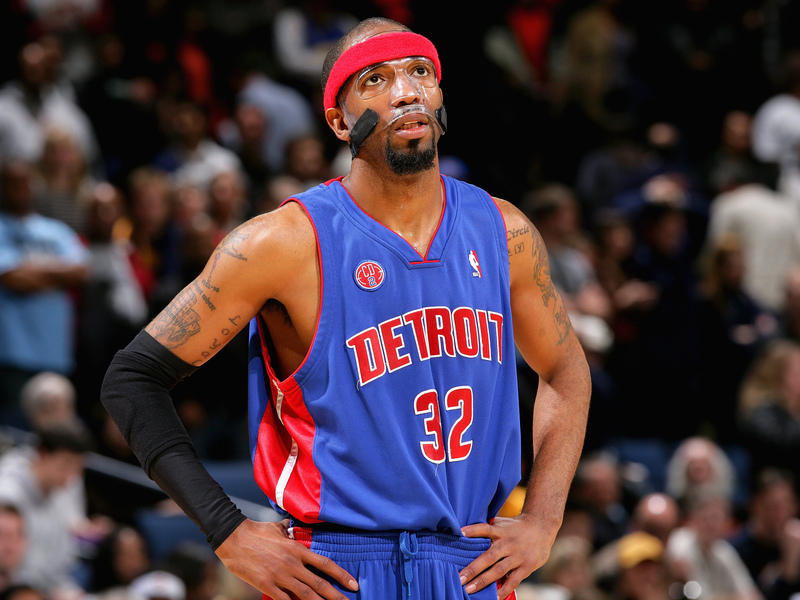 Richard “Rip” Hamilton was one of the most annoying players in the league for everyone who wasn’t a Pistons or Bulls fan. Hamilton would tire out your shooting guard on defense, and slowly kill your team with midrange jumper after midrange jumper. There should be a statue of Hamilton coming off a curl with a helpless defender raising his arms up in frustration outside of Detroit’s new arena. Hamilton, of course, was also famous for making the facemask fashionable in the NBA. I would love to tell you Hamilton’s career took off after he started wearing the mask, because it would really back up the thesis of this story. Unfortunately, it didn’t. Hamilton was so consistent for so many years, the mask didn’t—at least statistically—radically change his game. But every time you or your favorite team watched him strap that thing on, you knew it was going to be a groan-inducing night. And that counts for something. Oh, sorry, we were talking about accessories, not props. Kareem started rocking the goggles full-time after his move to Los Angeles, and they remain one of the ultimate old-man flexes. I’m convinced Kareem’s goggles were just for show, like Drew Carey’s glasses. I don’t see any corrective lenses in your Huffington Post headshot, Kareem! Imagine how demoralizing it must have been as a defender to not only have no way of preventing the skyhook, but also have to endure bucket after bucket from some dude wearing rec specs. Kareem knew what he was doing with the goggles. It was psychological warfare. This is not an accessory, and Erving rocked the ‘fro mostly during his ABA days, but damn. Dr. J’s afro made every finger roll, layup, and dunk 800% cooler. If Jerry West really doesn’t want to be the logo anymore, I can’t think of a silhouette more appropriate to represent the league than Erving’s.